I love pizza. Thin crust, Chicago style, Neapolitan, homemade, you name: I love it. So, when I decided I wanted to give a Julia Child recipe a try, I had to go with a pizza recipe. And, it it’s a healthy pizza recipe to boot! 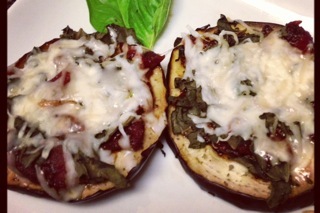 So, thanks to Pinterest I found this eggplant pizza recipe. And, wow, that Julia Child knew what she was doing. This is actually a great tasting recipe that was quick and easy for a week night recipe, which I need since I don’t get home until 7 pm and don’t get around to dinner until 8 pm or later. Start but washing your eggplant. First cut off both ends of the egg plant and then slice it into 3/4 inch thick pieces. You then need to put the eggplant pieces on paper towels, spring with salt, and let them dry out for about 30 minutes to draw out the water. This is pretty important. I thought it wasn’t important but the eggplant is a little more soggy if you don’t let it dry out. While your eggplant dries, make your sauce. Heat the 2-3 tsp. of olive oil and saute garlic until you can smell the garlic. Don’t let it brown: mine got a little brown when I turned around for just a few minutes so watch it carefully. Go ahead and add in the tomatoes, Italian seasoning and dried oregano. Let the sauce cook at a low simmer until it is thicken. Once your sauce is on, preheat your oven to 375 degrees F. Spray a pan with olive oil or non-stick spray. When your eggplant is dry after the 30 minutes, wipe the eggplant dry with a paper towel. 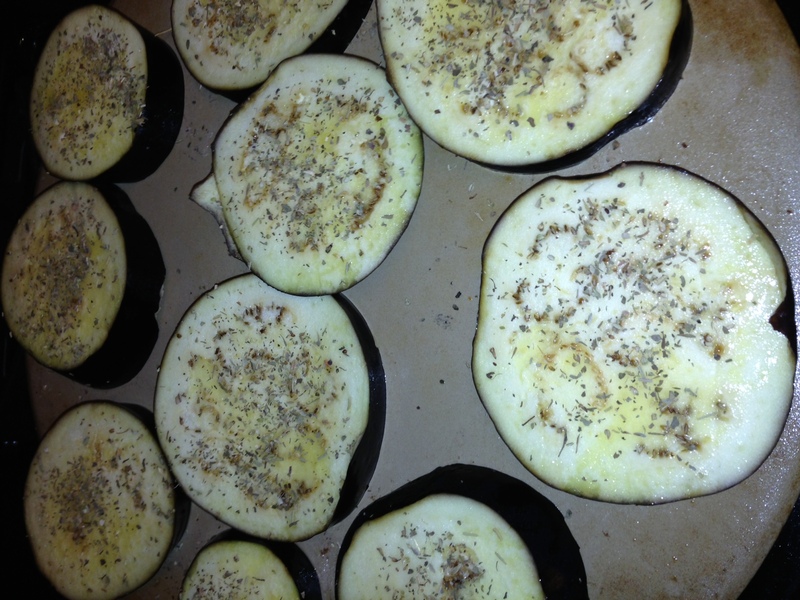 Lay the eggplant slices on the pan, brush the eggplant with olive oil, and sprinkle with the Italian seasoning. Roast the eggplant for 25 minutes but make sure you keep a close eye on it and pull it out before it becomes mushy or loses its shape. While the eggplant roasts, thinly slice the fresh basil leaves and combined the freshly grated parmesan and low-fat mozzarella cheeses. After 25 minutes elapses, remove the eggplant and turn the oven to broil. Spread a teaspoon or two of the tomato sauce on each slice of eggplant, sprinkle on the basil, and top with a generous amount of cheese. 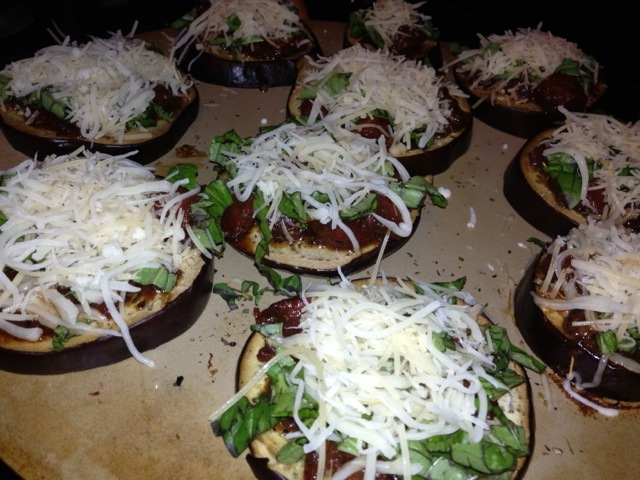 Put the eggplant in the broiler until the cheese is melted and slightly browned. Serve hot, with red pepper flakes if you like the heat!